Peter Abelard’s Letter to a Friend, frequently known as The Story of My Calamities, recounts the meteoric and disastrous career of one of the driving forces of the twelfth-century renaissance. 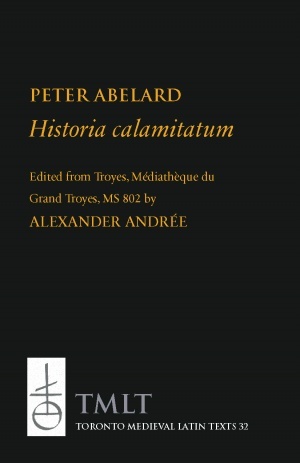 The son of a minor Breton noble family, a public intellectual who turned the academic establishment on its head, lover of Heloise, and sometimes his own worst enemy, Abelard produced in elegant prose one of the signal works of medieval autobiography. This new edition presents the Latin text as it appears in the earliest manuscript—until recently misdated by a hundred years—studded with a commentary that explicates the circumstances of its composition, context, and language. Published for the Centre for Medieval Studies by the Pontifical Institute of Mediaeval Studies. Alexander Andrée is an Associate Professor of Medieval Studies (Palaeography and Medieval Latin) and a Fellow of St Michael’s College, Toronto. He received his BA and MA in Latin Philology from Lund University and his PhD from Stockholm University in Sweden. He has held research fellowships at the Pontifical Institute of Mediaeval Studies in Toronto and Harris Manchester College, Oxford. His research is primarily focussed on Medieval Latin philology and the manuscript culture of the high Middle Ages; on the teaching and literature of the schools in the early twelfth century; on medieval biblical commentary, especially as pursued at the schools of Laon and Paris. He is the author of Gilbertus Universalis: Glossa ordinaria in Lamentationes Ieremie prophete. Prothemata et Liber I (2005), Christopherus Laurentii de Holmis: Sermones, Disputatio in vesperiis et Recommendatio in aula (2012), and most recently, Anselmi Laudunensis Glosae super Iohannem (2014).